Welcome to the Autumn edition of County Jottings. Our golfing season is complete and we have had an average year in the Leagues but a terrific win in the English Golf Union South Eastern Group Junior Foursomes. Our Junior Coaching programme to help identify our ‘stars of the future.’ has got off to a good start. Let’s hope it will continue into 2009 and beyond. We have also started another ‘Club & Coach’ programme through the BB&O Golf Partnership and our special thanks to all those volunteers who work tirelessly behind the scenes to make this a success. Congratulations to all the winners of our Championship and Trophy Events, also to those who represented the County at Junior, Colts, Senior and County levels. David Lane (Goring & Streatley) again represented England Seniors whilst Eddie Pepperell (Drayton Park) played in the Junior and 1st teams. Max Smith (Newbury Racecourse) represented England at Under 18 level and Harry Whittle (Woburn) represented England at Under 16 level. 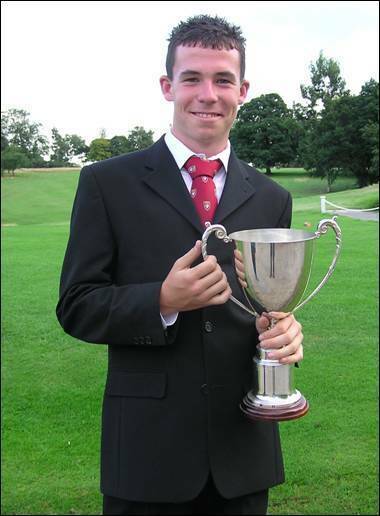 Tyrrell Hatton (Harleyford) has been selected for the Under 18 squad in 2009. Pepperell also represented GB&I in the Jacques Leglise Trophy against the Continent of Europe and has now moved into the Elite squad and played in the Home Internationals. 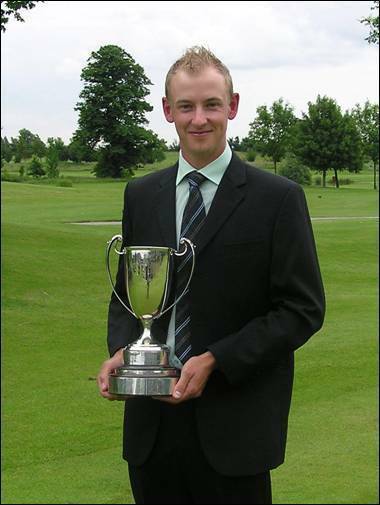 George Munsey (Frilford Heath) won the EGU Gold Medal at Woodhall Spa in August. Ashley Walton (Frilford Heath) won the main Order of Merit convincingly with Jake Canning (Stoke Park) taking the Junior Order of Merit. Our 2009 fixture list appears on the following pages and will be updated as soon as provisional dates and venues have been confirmed. Please visit our website to obtain details of our events and to download entry forms. These will be available from early January. Starting Sheets and Results are regularly updated throughout the season and we hope you find this service useful. Our website also contains details of all the Clubs within BB&O and contains links to other useful websites. Please let us know if you would like us to include any other information. We were soundly beaten by Middlesex at Sonning on 24th August. There was no way back after losing the foursomes 4-0 and despite a reasonable effort in the afternoon we eventually lost 3-9. Middlesex and Essex are tied on match and game points and if they draw it will be interesting to see how the SE Group decide the winners to face Surrey in the final. Team at Sonning: Adam Birdseye (Hazlemere), Kevin Freeman (Stoke Park), Adam Glass (Caversham Heath), Tom Lawson (Ellesborough), John McNally (Reading), Malcolm Reid (Royal Ascot), Ashley Walton (Frilford Heath), Adam Wootton (Oxford City). 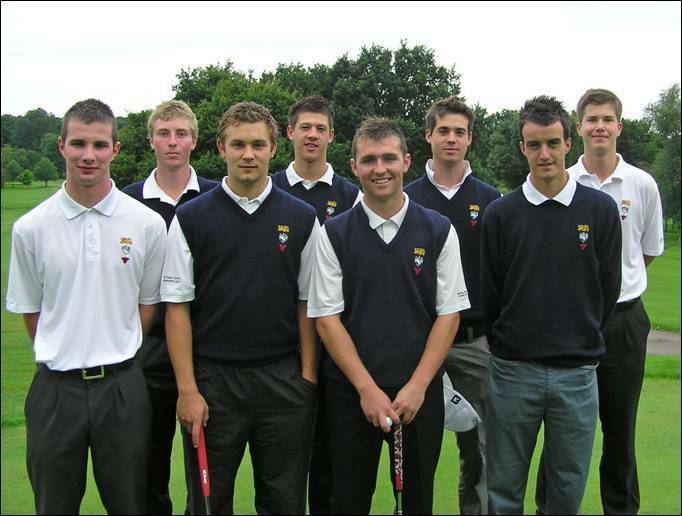 In our last match of the season we played Bedfordshire at Caversham Heath on 31st August. It was Duncan Forbes' last match as Captain and the team gave him a fitting farewell as they won with ease. Leading after the morning foursomes 3-1 - two early wins in the singles looked to give us the cushion we needed - before we had a slight wobble! The tail then really wagged and we ended the day winning 8-4. We finished 3rd in the League with 2 wins and 2 losses. 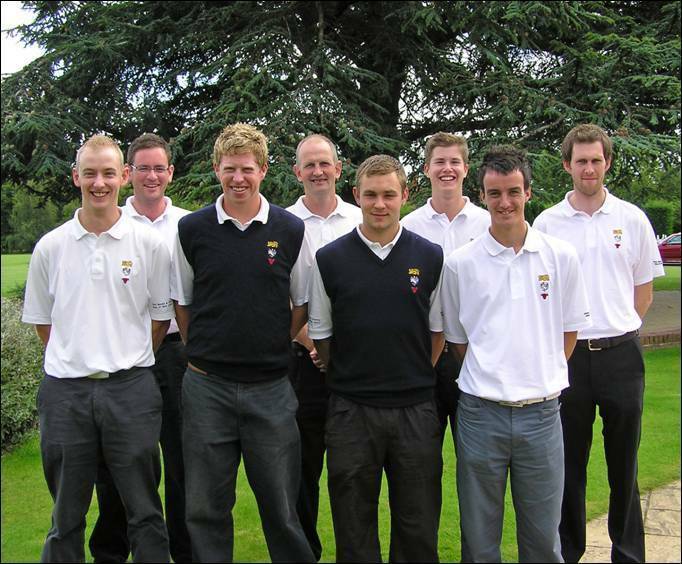 Team at Caversham Heath: Adam Birdseye (Hazlemere), Sean Elliott (Frilford Heath), Adam Glass (Caversham Heath), Tom Lawson (Ellesborough), John McNally (Reading), Malcolm Reid (Royal Ascot), Ashley Walton (Frilford Heath), Adam Wootton (Oxford City). Team at Enfield: Adam Birdseye (Hazlemere), Brandon Caddow-Young (Royal Ascot), Mathew Johnson (Chipping Norton), John McNally (Stoke Park), Tim Newton (Reading), Joe Winfield (Woburn), Adam Wootton (Oxford City), Dean Wright (Reading). 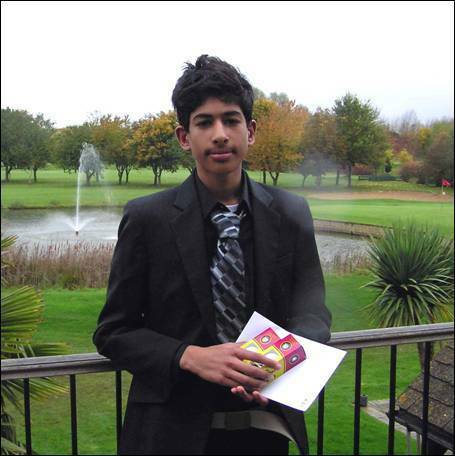 The Colts ended their League campaign with a fine win against Hertfordshire at Royal Ascot on 14th September. Trailing after the morning foursomes some fine golf in the afternoon turned the match around in our favour as we won 7-5. We finished 3rd in the League with 2 wins and 2 losses. Team at Royal Ascot: Adam Birdseye (Hazlemere), James Brockington (Henley), Brandon Caddow-Young (Royal Ascot), Jake Canning (Stoke Park), John McNally (Stoke Park), Dean Newbold (Frilford Heath), Joe Richardson (Frilford Heath), Dean Wright (Reading). At South Wilts on 10th August we enjoyed slender wins over Hampshire 5½-4½ and 6-4 over Wiltshire in this Friendly match. Team at South Wilts: Ben Beach (Burnham Beeches), Alex Bruce (Sand Martins), Alfie Bull ((Beaconsfield), Will Cooper (Woburn), Luke Fitzpatrick (Beaconsfield), David Langley (Winter Hill), Curtis MacGeever (Newbury Racecourse), Lyle Phillips (Goring & Streatley), Duncan Toms (Reading), Jordan Williams (Hadden Hill). At North Middlesex on 12th August we fought back to draw with Middlesex 7½-7½ but had a comfortable win against Bedfordshire 10-5. Team at North Middlesex: Ben Beach (Burnham Beeches), Josh Brass (Castle Royle), Alex Bruce (Sand Martins), Alfie Bull (Beaconsfield), Declan Duffy (Burford), Luke Fitzpatrick (Beaconsfield), David Langley (Winter Hill), Curtis MacGeever (Newbury Racecourse), Joe Townsend (Burford), Jordan Williams (Hadden Hill). Team at Muswell Hill: George Abbott (Chiltern Forest), James Foster (Newbury & Crookham), Jordan Mann (Sand Martins), George Munsey (Frilford Heath), Dean Newbold (Frilford Heath), Joe Richardson (Frilford Heath), Ben Roche (Woburn), George Wilson (Woburn). We had a good victory over Surrey 9-6 in this annual match kindly sponsored by the MUGS. The boys all enjoyed the day at Huntercombe on 26th August and were given a gift by the MUGS to commemorate the day. Team at Huntercombe: George Abbott (Chiltern Forest), Jake Canning (Stoke Park), James Foster (Newbury & Crookham), Findlay Ingram (Calcot Park), Jordan Mann (Sand Martins), George Munsey (Frilford Heath), Dean Newbold (Frilford Heath), Joe Richardson (Frilford Heath), Matt Robinson (East Berkshire), Alex Stubbs (The Oxfordshire). 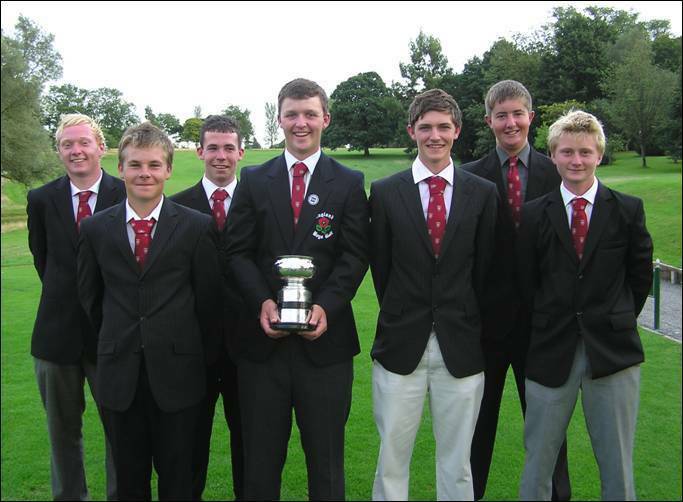 The Juniors lost both their matches at Crews Hill on 27th August. Soundly beaten by Sussex we performed slightly better against Middlesex but still lost by 3 points. 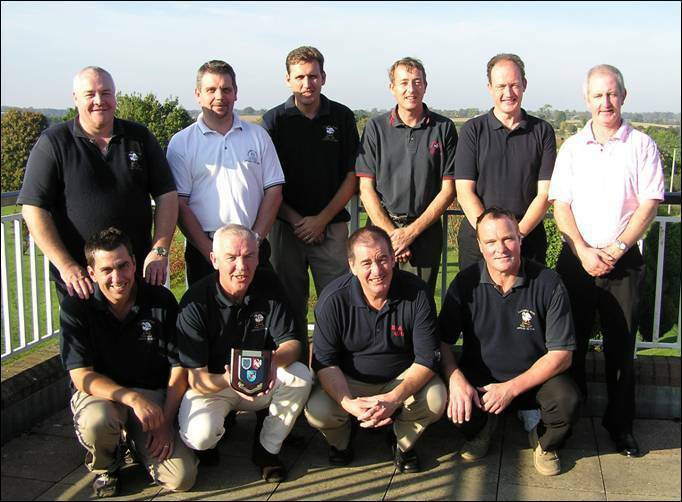 Team at Crews Hill: James Brockington (Henley), James Bromham (Richings Park), Michael Johnson (Maidenhead), Mark Kirby (Richings Park), George Munsey (Frilford Heath), Dean Newbold (Frilford Heath), Steven O’Connor (Tadmarton Heath), James Tobia (Woburn), Andy Tucker (Frilford Heath), Chris Whelehan (West Berkshire). At Hayling on 13th August not only were we up against a strong Hampshire side in the morning, but also the elements with 50mph gusting winds, playing havoc with the Seniors' swings and toupees. There was hair and balls flying everywhere. Absolutely exhausted after their morning efforts the afternoon final between us and Surrey was postponed and took place at the same venue on 29th September. We lost to Surrey in the final after a very disappointing performance at Hayling on 29th September. After a good win against Hampshire in the semi final we hoped for better things, but alas, that was not to be. Team at Hayling Island: Jim Cameron (The Oxfordshire), Bob Clarke (Mentmore), Rod Crisp (Ellesborough), David Doodson (Temple), Duncan Forbes (Sonning), Neil Franklin (Beaconsfield), Robert Gill (Gerrards Cross), David Lane (Goring & Streatley), Gilbert Runnicles (Gerrards Cross), John Summers (Frilford Heath), Tommy Wells (Burnham Beeches), Jim Wilson (Frilford Heath). 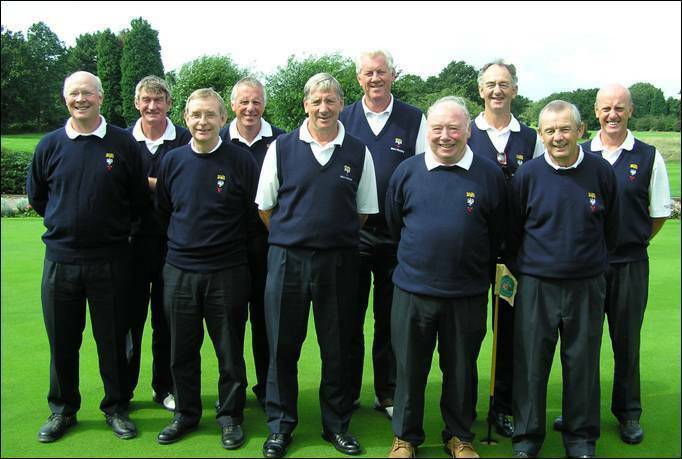 Team at Fulwell: Jim Cameron (The Oxfordshire), Bob Clarke (Mentmore), Rod Crisp (Ellesborough), David Doodson (Temple), Duncan Forbes (Sonning), Neil Franklin (Beaconsfield), Gilbert Runnicles (Gerrards Cross), Derek Walton (Frilford Heath), Tommy Wells (Burnham Beeches), Jim Wilson (Frilford Heath). The League title depended on the result of this match at Maidenhead on 17th September. A win for either team would secure top place and a close match was ensured. Regrettably we were not able to produce the goods on the day and lost out 6-4. We finished 3rd in the League with 2 wins and 2 losses - both of which were at home. Team at Maidenhead: Jim Cameron (The Oxfordshire), Bob Clarke (Mentmore), Rod Crisp (Ellesborough), David Doodson (Temple), Neil Franklin (Beaconsfield), Robert Gill (Gerrards Cross), Ian Hunter (Maidenhead), Gilbert Runnicles (Gerrards Cross), John Summers (Frilford Heath), Jim Wilson (Frilford Heath). 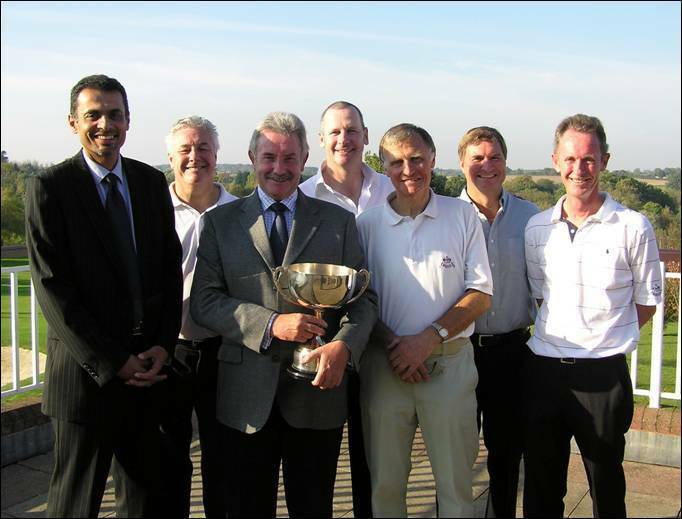 The BB & O Autumn Trophy was played at Goring & Streatley Golf Club on Friday 19th September 2008. We had a good entry of 55 for the final Order of Merit event, once again, consisting mainly of players of 5 handicap and below. Ashley Walton (Frilford Heath) had already secured the OOM title after his nearest rival Tom Wilde (Beaconsfield) could not play in this event. The morning scoring was very good with Christy Whelehan (West Berkshire) and John Griggs (Burnham Beeches) making the best of the ideal scoring conditions. Whelehan led by one, after a fine 3 under par 68, from Griggs. Nick Jacobs (Goring & Streatley) and George Wilson (Calcot Park) were just a further shot back. There were another 18 players on 75 and below in what one was one of the best morning’s golf at a Championship for quite some time. The afternoon scoring was even better as the players enjoyed the fine weather after a miserable summer. The early pace was set by Andy Codling who added a 2 under par 69 to his morning 72. This was soon overtaken as Nick Jacobs from the home club had a superb round of 67 to finish on 5 under par for the day. His two round total of 137 looked assured of giving him victory. However, out on the course John Griggs was also playing great golf and having reached the turn in 2 under par he continued to make inroads into Jacob’s lead until a slight mistake on the 13th halted his progress. Meanwhile on the other side of the course, Nick Hills (Donnington Grove) was in scintillating form. After a 71 in the morning he needed something special and was still 3 shots off the pace after 11 holes. He then fired off 3 birdies in quick succession to tie both Jacobs and Griggs before he slotted home a putt for a birdie 2 at the last to come home in 31 for a 6 under par 65 – in spite of 2 bogeys! His round was just one off the course record and he was a worthy winner of a highly competitive Championship. With Jacobs and Griggs taking the 2nd & 3rd prizes in the Scratch event, the leading Handicap prize went to Ollie Ebsworth (Burford) after an excellent afternoon net 64 was added to his morning 71. Andy Codling and George Wilson took 2nd and 3rd spot respectively. The BB & O Boys 14 years and Under Championship was played at Bicester Country Club on Tuesday 28th October. There was a good entry of 32 boys with handicaps of 20 or less for this Championship which has been changed to an 18 hole competition. This enables us to start later in the morning and avoid the possibility of a frost delay, which certainly would have been the case this year. Once again we had a mostly dry day, a bit cold but quite sunny. Most of the Boys found scoring difficult with the course playing quite long. With three holes to play things were very close with 4 players in with a real chance. Alex Wills (Harewood Downs) was still in the hunt despite a double bogey on 16th and was level with Will Cooper (Woburn). James Butterworth (Harewood Downs) and Alfie Bull (Beaconsfield) were playing together and were tied a shot ahead of Wills and Cooper. All the players found the last 2 holes extremely difficult and in fact only one par and one birdie were recorded on the 18th all day. As they approached the 18th green Butterworth and Bull were tied. With Butterworth on the back of the green in 2, albeit in ‘three putt territory, and Bull in trouble it seemed likely that the title would go to the Harewood Downs player. Bull managed to get his 4th shot to some 30 feet on a highly sloped green and then holed the next for an unlikely 5. Butterworth meanwhile had got reasonably close with his effort from the back of the green but did not manage to hole the tricky return. This left both players tied on 79 but under the rules the Championship is decided on countback and the Title went to Alfie Bull (Beaconsfield). In the handicap prize section Reyhan Jethani (Wexham Park) produced the net round of the day with a fine net 68. Alex Wills (Harewood Downs) had net 70 but was awarded 3rd Scratch so the 2nd and 3rd handicap prizes went to Danny Court (Reading) and Luke Fitzpatrick (Beaconsfield) respectively. The 14th Final of the Hillman Trophy Plate between Flackwell Heath AGC and Woburn GC took place at Buckingham GC on Sunday 12th October. Play is over 18 holes singles matchplay for a seven man team, with each team having three players in handicap range 6 to 9 and four with a handicap of 10 and over up to a maximum of 20. 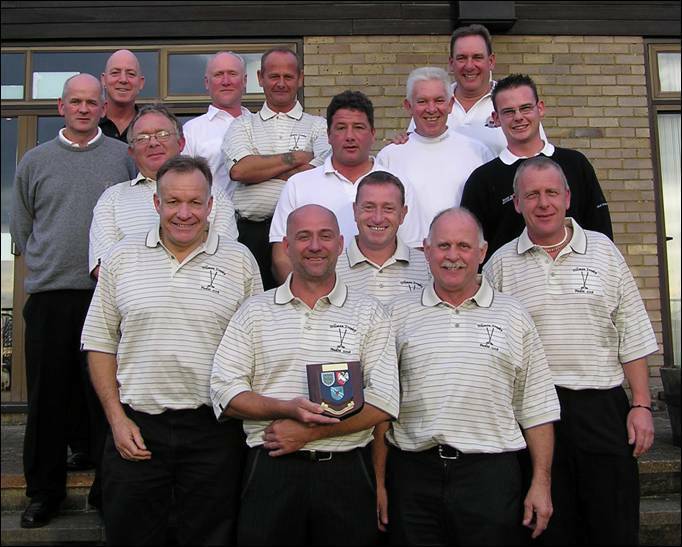 Woburn had won the Hillman Trophy on 3 occasions but this was the 1st Final for Flackwell Heath Artisans. Our smallest club against our largest club! On a wonderful sunny day the final was played in terrific spirit with Woburn taking the Trophy by 5½-1½. Everyone was very grateful for the warm hospitality given to us by the host club and for the fine condition of the course and hospitality. 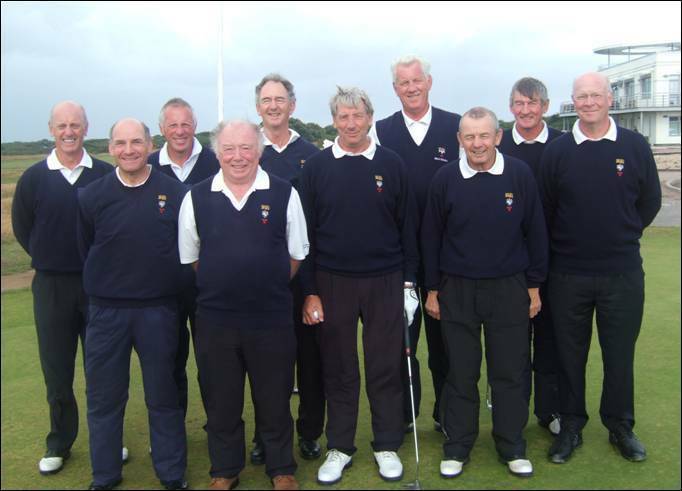 Woburn GC: Tom Brady, Kevin Bryam, Mo Dewji, Colin Griffiths, Ray Greenall, Bryan Nickless, Grant Osborne. 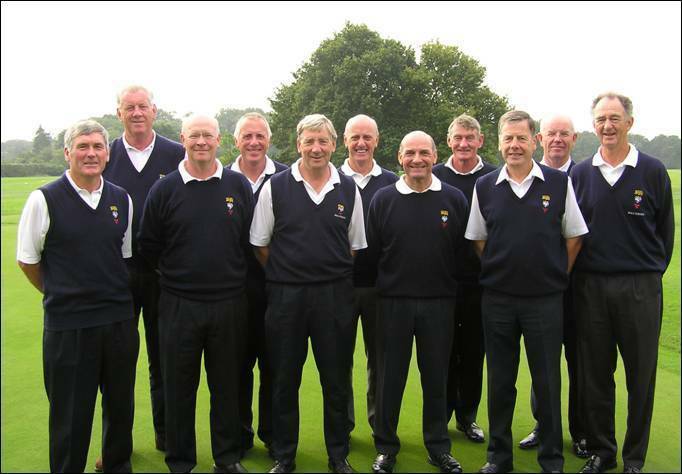 Flackwell Heath AGC: Derek Clarke, Kevin Dolan, Ian Harrison, Michael Monaghan, Alan Smith, Darren Smith, Kevin Tucker. The 17th Final of the Hillman Trophy has taken place at Ellesborough GC on Saturday 18th October. Play is over 18 holes singles matchplay for a seven man team, with each team having three players in handicap range 6 to 9 and four with a handicap of 10 and over up to a maximum of 20. Both teams were in the Final for the 1st time. 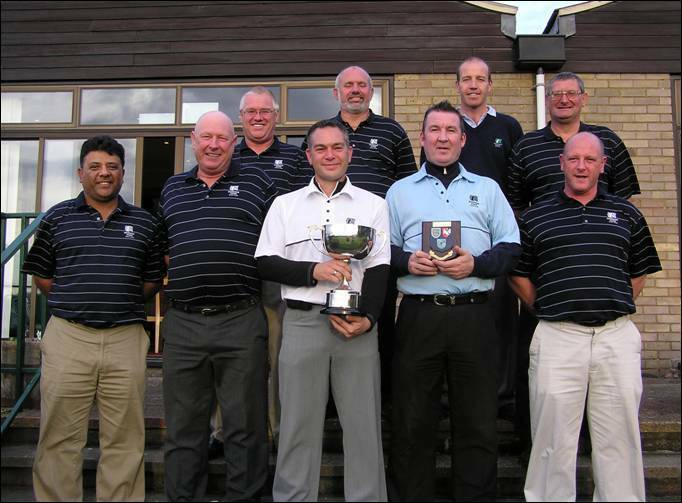 In a thrilling climax to a season long event, Richings Park and Oxford City tied the match 3½-3½ After 1 extra hole Richings Park took the Trophy. Everyone was very grateful for the warm hospitality given to us by the host club and for the fine condition of the course and hospitality. 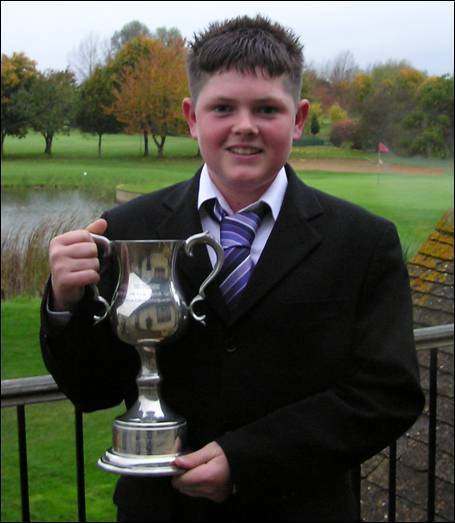 Jake Canning (Stoke Park) has run away with the Junior Order of Merit Trophy. 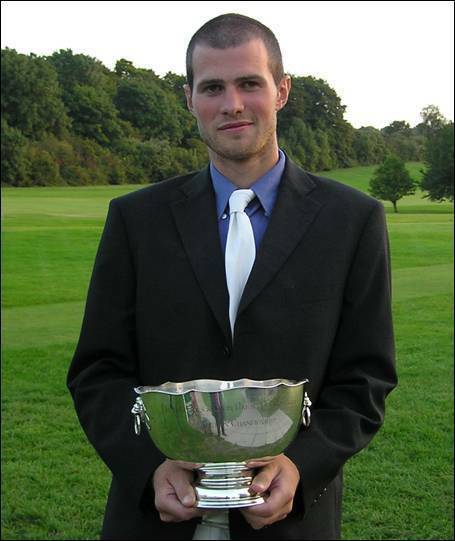 His 3 outright wins and a tie for first saw him finish 25 points clear of Asa Phillips (Goring & Streatley). Ashley Walton (Frilford Heath) won the OOM by 9½ points from Tom Wilde (Beaconsfield). Congratulations to the County Champion on his very successful year. Ashley also finished a very creditable 3rd in the Champion of Champions Tournament at Woodhall Spa on 20th September. Played at The Warren Golf Club on Wednesday 20th & Thursday 21st August Our Team of 7 players were: Max Smith [Captain (Newbury Racecourse)], Sandy Bolton (Magnolia Park), James Brockington (Henley), Jake Canning (Stoke Park), Ben Cotton (The Oxfordshire), Tyrrell Hatton (Harleyford), Oli Tite (Witney Lakes). The format is to play 2 foursomes games both morning and afternoon. Counties are allowed to play any 6 of the 7 players throughout the Championship. With 11 Counties in the English Golf Union South Eastern Group 2 must drop out each year to allow the event to be completed in two days. After last year’s encouraging performance we were in a positive mood and felt we had a good chance of challenging for the title. We had a strong side with Tyrrell Hatton having just won the Faldo Series at Walton Heath the day before, breaking the course record on his way to a 10 under par 36 hole total. Max Smith was fresh off an excellent run in the Boys Championship and Home Internationals and Jake Canning had just won the BB&O Junior Order of Merit Championship. We got off to a dream start on the first morning beating both Essex and Hertfordshire. The match against Hertfordshire was very tight but we held our nerve to earn points from each game on the last green. We continued the good work in the afternoon to record comfortable wins against Hampshire and Sussex. We led after day one and a sterling effort was needed on the Thursday morning if we were to hold on to the lead. A series of very close games ensued with us fighting back on several occasions. At the death we held firm and registered 2-1 wins against Middlesex and Norfolk. The mathematics in the afternoon showed that baring 2 catastrophic defeats and Sussex winning both their matches, we would win. All the players were very tired and up against a Kent side determined to avoid relegation we lost 2-1. However the news in the Surrey match was much better. Smith and Cotton earned a ‘winning half’ in their game before Hatton, playing with Brockington, holed a telling 12 foot putt for birdie on 18th to win their game and seal our first victory in this event since 1999. Continuing the fighting spirit of the team over the 2 days it was fitting that Jake Canning, playing with Sandy Bolton, should hole a similar putt for birdie, to half their match against Surrey having been 4 down after 10 holes. A great all round performance from all the players.